Dee Rees' Mudbound opens with a scene that is a figurative baptism of sorts. It's the 1940s and a torrential rain pours down on two brothers -- Henry and Jamie McAllan -- as they dig a grave for their late father on their Mississippi farm. After some time the younger brother Jamie (Garrett Hedlund) finds himself overwhelmed by the fast rising water in the grave he's standing in. Jamie's older brother Henry (Jason Clarke) is no longer in his field view at the top of the grave. It's cause for panic. The water is so harsh that Jamie is quickly victim to the muddy waters washing over him in defeat. Then, a beat later, a ladder appears and Henry lifts his drenched younger brother from the grave. Upon first viewing, the elemental forces at work here give subtle imagery to a resurrection of the body. But by the end of Mudbound, this scene takes on a deeper meaning for the reckoning of sins and a thirst for forgiveness. In short, Jamie is plunging himself into the rainy waters to absolve himself of the actions that have brought him to this very moment. This is a film about people looking to be saved from the strifes that shackle them, albeit moral or societal. Mudbound isn't only about the McAllans. It simultaneously tells the story of the Jackson Family--and with great affection. The Jacksons are African American and they are tenants on the McAllans' land; the Jacksons pay their own rent, thus sustaining some semblance of independence, but are still obliged to answer the McAllans' every beck and call. That dynamic of dependence puts a strain on the shoulders of the Jackson patriarch Hap (a spectacular Rob Morgan, most recently of Stranger Things). Hap and his wife Florence (Mary J. Blige, in a transformative turn) run a loving household, preaching and practicing the values of hard work and dignity. Their stoicism and commitment to familial bonds reminded me of Paul Winfield and Cicely Tyson's Morgan family in Martin Ritt's 1972 film Sounder. Every scene with Morgan and Blige hums with a silent heartbreak. We want them to endure and come out okay in the end but we know what they're up against. The spur for a common thread between the McAllans and the Jacksons ends up being World War II, as Jamie (Hedlund) serves in the aerial unit and the Jacksons' oldest son Ronsel (Straight Outta Compton's Jason Mitchell) serves as a tank sergeant. Both men witness horrors in the war but Ronsel in particular also finds beauty in his experience overseas. For once, he's not suffocating under an avalanche of racism and civic hostility. He even takes up a romance with a Caucasian German woman. It's when both men return home and strike an unlikely friendship that the gears of spite and interest from third parties begin to turn. Hedlund and Mitchell are very good together; their scenes of two men trying to adjust back to normalcy radiates with convincing warmth. 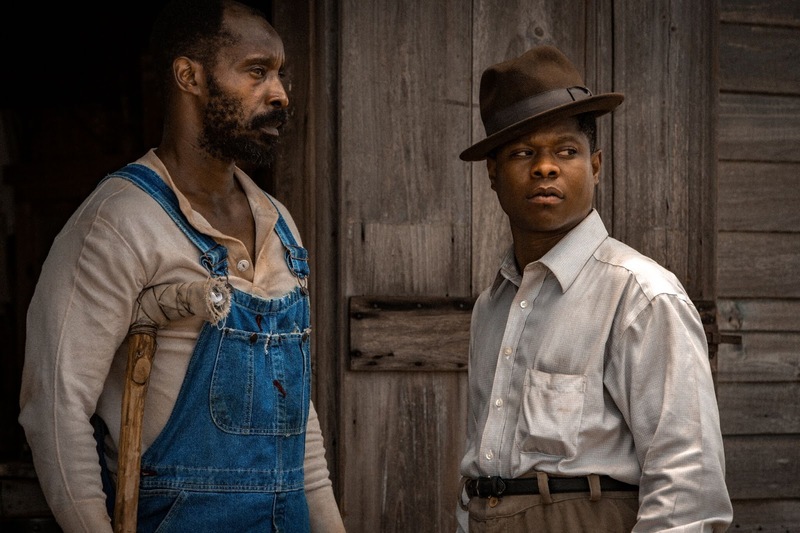 It makes the final third act of Mudbound that much more riveting and devastating. Like reading a sweeping novel, we are rattled by every development that arrives upon characters we have invested ourselves in. Dee Rees' film is that kind of experience. Although Mudbound makes its premiere on Netflix this Friday November 17th, I urge those of you who are near movie theatres playing it to go watch it on the big screen. The editing by Mako Kamitsuna, the production design by David J. Bomba, the direction by Rees and the performances by its ensemble cast are all of Oscar quality. This is one of the big ones for 2017.